The NBA during the 1970s was defined by an overall increase in athleticism, league-wide parity and an upstart competitor with the ABA. 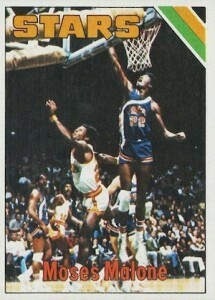 It was also a burgeoning era for basketball cards. While a number of top players emerged during the decade from both the NBA and ABA, many of the best rookie cards for Hall of Fame players from the period remain appealing budget options. Despite not yet achieving a mainstream appeal, professional basketball during the 1970s was exciting and helped grow the league. The collecting scene also benefited because card collectors finally had the consistency necessary to help cultivate the market. Every season throughout the decade was covered by Topps, including both ABA and NBA players in most of the years. View each basketball set from Topps during the 1970s here. Looking back at that period of basketball, we are left with some loud designs, plenty of color, and a roster of HOF talent. The biggest names, like Julius Erving and Pete Maravich, remain more expensive, but the rest of the elite talent is fairly cheap. The following list looks at 15 of the best budget Hall of Fame rookie cards from the 1970s. Every card on the list can be found ungraded for under $50, and many are closer to $20. However, most of the high grade cards still maintain a considerable premium. For a modern look at Hall of Fame rookie cards, check out our guide to 1980s and 1990s basketball HOF budget rookie cards here. Click on the title or images to shop for singles on eBay. Nicknamed "Tiny," the diminutive Nate Archibald played like he was a giant. Archibald was a six-time NBA All-Star and won an NBA title with the Boston Celtics in 1981. The prolific point guard led the league in both assists and scoring during the 1973 season. Although he played for the Milwaukee Bucks to his end his career, to most fans, Dave Cowens will always be a member of the Boston Celtics. 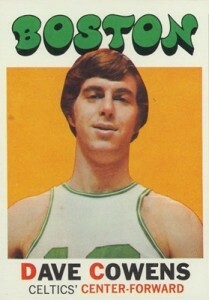 Cowens won titles with the Celtics in 1974 and 1976 and was the league MVP in 1973. 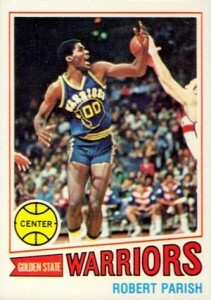 He was named to seven NBA All-Star games and was the 1971 Rookie of the Year. As the first overall pick in the 1970 NBA Draft, Detroit had big expectations for Bob Lanier. Although he never achieved the ultimate goal, an NBA title, Lanier still put together a HOF career, including eight NBA All-Star appearances and an All-Star MVP award in 1974. 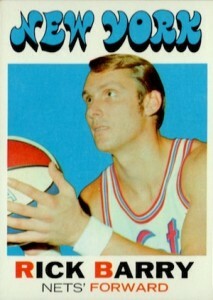 Widely considered one of the best of his era, Rick Barry was a dynamic scorer and well-rounded player. He was an eight-time NBA All-Star and four-time ABA All-Star during his impressive career. Barry was the 1966 Rookie of the Year and led the Oakland Oaks to the ABA title in 1969. He later helped the Golden State Warriors win the 1975 NBA title and was named the Finals MVP. Artis Gilmore was another player that excelled in both the ABA and NBA, totaling 11 All-Star appearances, including six with the NBA and five with the ABA. 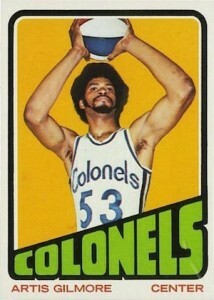 Gilmore earned the ABA Rookie of the Year and league MVP in 1972, and took the Kentucky Colonels to the ABA title in 1975. 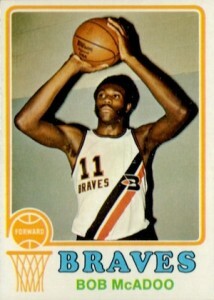 He also was named the 1975 ABA Playoffs MVP. After starting his collegiate career at a community college in Indiana, Bob McAdoo joined Dean Smith at the Univeristy of North Carolina for one season. 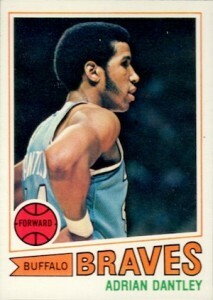 Taken second overall by the Buffalo Braves, McAdoo was named the 1973 NBA Rookie of the Year. At his peak, McAdoo was one of the best players in the league, winning the 1975 MVP and earning five NBA All-Star nods. 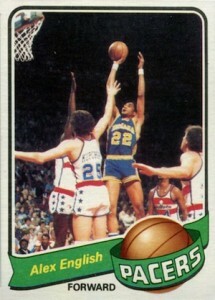 Later in his career, McAdoo won NBA titles with the Los Angeles Lakers in 1982 and 1985. Although he is not as decorated as many of the other HOF players, Bill Walton was a beast in college with UCLA and a dominant NBA player. He was taken first overall by the Portland Trail Blazers in 1974 and had his best seasons with the Blazers and later with the Boston Celtics. Walton was only named an NBA All-Star twice, but he was the league MVP in 1978 and won two titles. 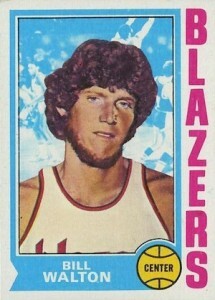 Bill Walton was the Finals MVP during his title run with Portland in 1977 and was the Sixth Man of the Year with the 1986 NBA Champions, the Boston Celtics. Referencing his cool demeanor on the court, George "the Iceman" Gervin has one of the best nicknames in basketball history. 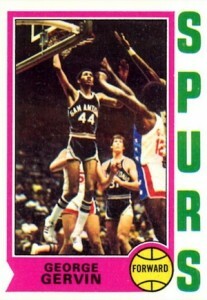 Gervin was a nine-time All-Star in the NBA and a three-time ABA All-Star. Even without winning a title, Gervin made his mark on the league thanks to his trademark finger roll. Moses Malone might be one of the most undervalued and under-appreciated NBA players of all-time when it comes to to the collecting world. His only title came in 1983 with the Philadelphia 76ers, but Malone was a 12-time NBA All-Star and two-time ABA All-star. He was also named the NBA MVP three times, and was the Finals MVP during his lone title run. Despite this, Malone's ungraded rookie cards can be easily found for under $25 and most of his certified autograph cards go for less than $50. After taking NC State to the NCAA title in 1974, David Thompson was selected first overall in both the 1975 NBA and ABA drafts. 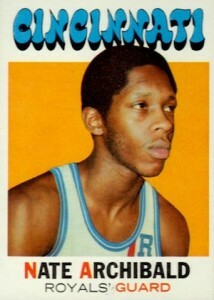 He signed with the Denver Nuggets and was named the 1976 ABA Rookie of the Year. Thompson would go on to be named to one ABA All-Star team and four NBA All-Star teams. Even though he never won an NBA title, Thompson was one of the most athletic players of his time and was one of the first players to utilize the alley-oop pass. The 1977 NBA Rookie of the Year, Adrian Dantley could score on anyone, but had trouble sticking with any team for more than a few years. The six-time NBA All-Star led the league in scoring in 1981 and 1984. Robert Parish played with several teams, but is mainly remembered from his time with the Boston Celtics. Parish won three titles and earned nine NBA All-Star appearances with the Celtics. He won one more title with the Bulls during his last season in 1997. 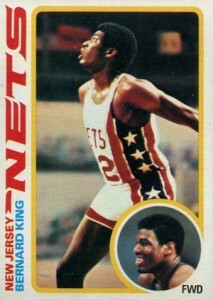 Another elite scorer, Bernard King was a late entry to the Hall of Fame. The league scoring leader in 1985 was a four-time NBA All-Star, but injuries took their toll. King missed almost three entire seasons because of knee injuries and was finally forced to retire in 1993. Another player that is seemingly overlooked, Dennis Johnson is thought of as one of the greatest defenders in league history and was known for coming up big in important moments. 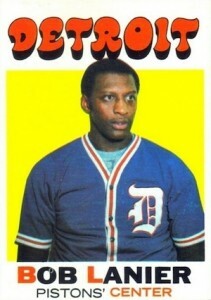 Johnson passed away in 2007 and did not live to see his name enshrined in the HOF. 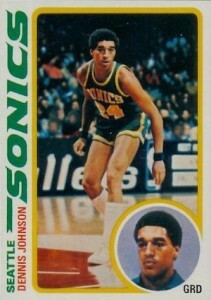 Dennis Johnson was a three-time NBA Champion, winning one title in 1979 with the Seattle SuperSonics, where he was also named the Finals MVP, and two titles with Boston Celtics in 1984 and 1986. He was also a five-time NBA All-Star. Rounding out the list, Alex English played for several teams during his career, but saw the most success with the Denver Nuggets. 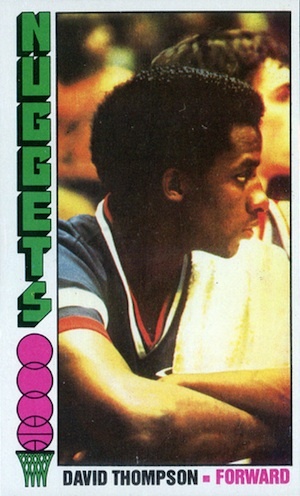 English was an eight-time NBA All-Star, all with the Nuggets, and also led the league in scoring in 1982-83. Even more impressive, Alex English was the top overall scorer of the 1980s.